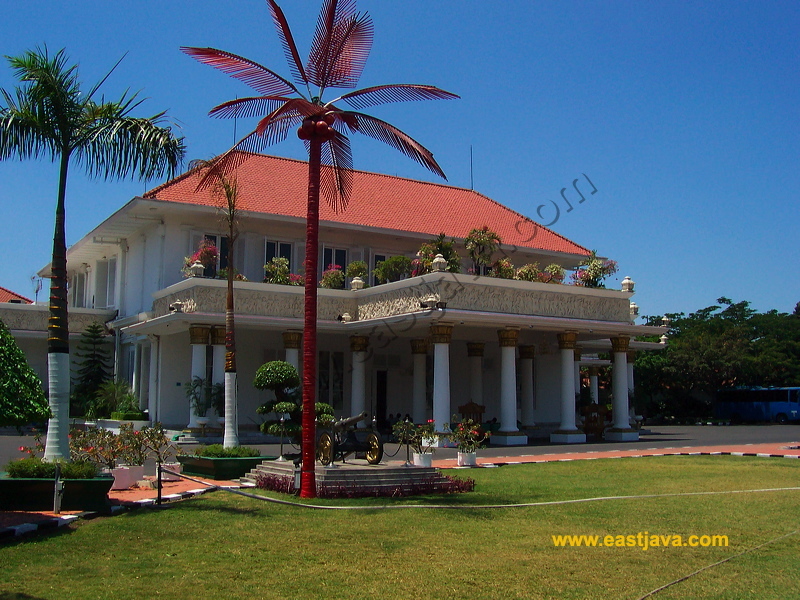 Grahadi building is convention hall and the official resident of East Java Governor. See it’s a self remain as of the Dutch commissioner Dirk Van Hogendorp (1794-1798). Initially the front of Grahadi faced the river. During tea-hours in the afternoon, the occupants could see small vessels with passengers up and down the river. The small vessels used to transportation, they arrived and go by the small vessels. In 1802 the front side of building which originally faced the North, had changed into the South until the present time. Located in Surabaya City, not far from Tunjungan Plaza shopping centre, precisely in Gubernur Suryo Street the tourist can meet a luxury building that has history during in the past. This building is known as Grahadi because in this building there is a meeting space, which called Grahadi. Grahadi come from Sanskrit dissyllabic "Graha" mean House and "Adi" mean high degree. Name of Grahadi means house that has high value or degree. Though two centuries have elapsed but this building is still stand up steady and still in it original presentation. For the enthusiast and architecture admirer are surely interested with the typical architecture appearance namely architecture style of Dutch Indies government that dominated by straight lines, vertical and horizontal with aesthetic and well-balanced composition so that fair if this building is categorized in the monumental buildings form which maintained carefully. This high-rise building have two mains building with 2016 m2 width, supporter building 4125,75 m2 and located in 16284 m2 width area. At first floor in the building is divided into some rooms for example sitting room, meeting space of East Java Government of First Level. Flagpole palm tree and green grass outspread in the yard add this increasingly view. 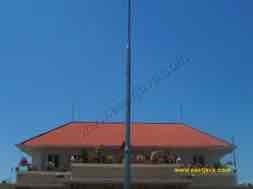 Building which save many historic events can be visited by tourist but should ask a permission by sending notice to Superintendent of Public Bureau Household of East Java Secretary Government of first level in Pahlawan Street 110, Surabaya. Behind the building flow Kali Mas River that applied for water tourism by using boat follow the river current to enjoy some of Surabaya towns. This water tourism is opened generically start on Monday until Friday at 17.00-19.00 WIB, Saturday at 13.00-19.00 WIB, Sunday at 09.00-19.00 WIB. In the riparian of Kali Mas River, there is Taman Prestasi where children can play at while they have recreation. Achievement Garden is opened generically every day in the evening. Building which its age is more of two centuries course still seen sturdy because besides supported by the architecture style also supported by a real strong building construction. Wall, wide room wall and height, both in first floor and also in the second floor all had made from big ones red stone without concrete and cemented support, but seen strong and steady. The ventilation and draught in room with wooden door and windows, and big milk glass ones, make the room felt fresh and light in the daytime. Teak, except for cushion door and windows, is also utilized as component of main standard building boom level I and also as floor. All room is upstairs floor of thick teak wooden as supporting facilities for big logs in long measure utilize building boom. Doorstep that connecting the elementary floor with room of level I entirely made from teak material that is up this still original until now. This building is also equipped with open gallery with building frontage which its roof sustained by pillars in Romaine / Greece architecture. State Building built in 1795. At that time the unique power (Gezaghebber) Dutch, Dirk Van Hogendorp (1794-1798) of his opinion that opening habitat in town under, near by Jembatan Merah, less position as according to him. 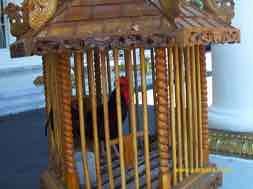 He chooses a piece of land by the side of Kali Mas for built by a garden house which more representative. Area in Pemuda Street which formerly called Simpang, property of a Chinese that is initially reluctant deliver it to Van Hogendorp, but according to story he finally successfully forced smoothly with statement that the area will be kept for him. According to story, the owner only had given indignation of (25 cents). From word "kept" then borne word Simpang. Van Hogendorp built the building with expense of 14000 two-and-a-half rupiahs. But he enjoyed the habitat only about three years only. 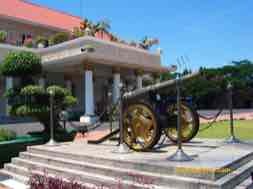 During his position, he sighs submitted to Central Government of Dutch Indies in Batavia (Jakarta), for example he is alleged to misuse power for the sake of person. That is why when performed reception of New Year on 1 January 1798, he catch and sent to Batavia. Dutch Governor General Daendels, which is known as 'Toean Besar Goentoer', improve the Grahadi, Building he wish to make the building as a palace. Beside that, is also built a bridge above Kali Mas, which now flow rear the building. In the beginning, this building of course faced to Kali Mas, so that in the evening its dweller with have drinking tea they also can see boats tracing times. The boats also exploited as supporting facilities for transportation. They come and go by using boat to trace Kali Mas. In the next development is luxury building that also used for session place Raad van Justitie (High court), also used for party, reception and others. In 1802 Grahadi Building, which initially face to north is changed position become to face to south like present. It is crossed by it, there are garden which called Kroesen (Taman Simpang), what taken away from Resident JC. Thorium name Kroesen (1888-1896). Rear the garden there are Joko Dolog statue is coming from Singosari Empire, which now still standing steady. Since Indonesia independence the first East Java Governor who residing in Grahadi is RT. Soerjo (1946-1948), which his statue is, now seems to be crossed the building. 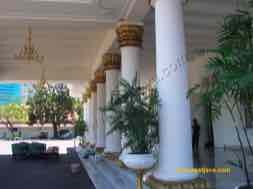 Since governor Samadikoen (1949-1957) hitherto this building is made as the state building to receive guest, reception, and other meetings, while the Governor self is resided in other residency in Surabaya town.